April Gornik was recently at the Parrish Art Museum signing copies of her new book April Gornik Drawings. The book is an extensive collection of her charcoal on paper drawings. I was able to attend. "Her paintings are the essentials of her artistic caraeer, but the charcoals, being dense and compact, balance the scale when weighed against the spacious and airier canvases, and make her artistic output whole. For a person so sunny and bright - both in personality and visual presence - to have created a dark counterweight that rivals her work as a painter, deepens and broadens the definition of herself as artist. In the drawings, she piles black on black, until it is as opaque and bottomless as Seurat's Conté crayon. 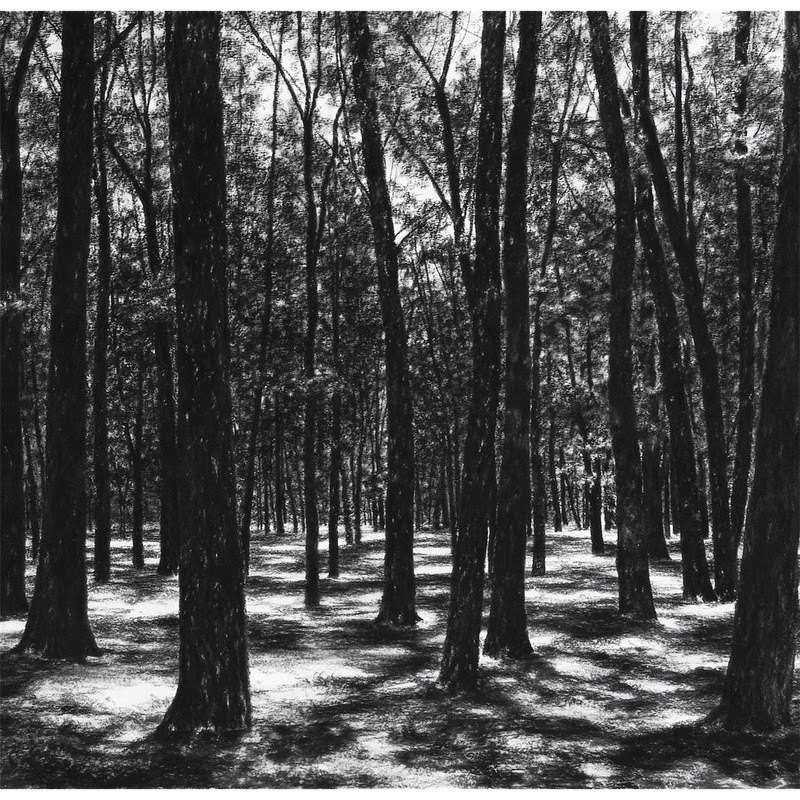 So, how far can an artist look into the woods? Until she reaches the white of the paper." - Steve Martin from April Gornik Drawings. April Gornik's work is both worldly and otherworldly, realistic and surrealistic, familiar yet unfamiliar. Each piece a meditation, visual poetry to be contemplated. The work inspires deep emotion. Composer and pianist Bruce Wolosoff was inspired to create a piece for cello and piano while gazing at April Gornik's drawing The Woods, 2006 on his piano's music stand. Wolosoff's original manuscript of For April is printed in the book and a download card is included. The book also includes a conversation that the author Lawrence Weschler had with April Gornik in her Sag Harbor studio last summer as well as an essay by the artist Archie Rand. In her conversation with Lawrence Weschler she describes how she began to create landscapes, "Well it was after college, and I was making sculpture-like objects. Like I would make a trellis and try to make it look as if light were falling on it, gluing tin to it, painting it a little. I was trying to do everything I could not to paint, since it was 1977, and you just weren't supposed to do that anymore. I was trying to make what I was thinking of as primitive symbolic objects, something archetypal, I was really confused! And then one day I actually saw somthing in my head - three or four sticks backlit against the shore of some water - and don't ask me where this came from, I have no idea, but immediately took to cobbling it together with the junk that was in my studio. I had some house paint and some regular paint, and I just made this thing, and stepped back.. and it was a landscape." 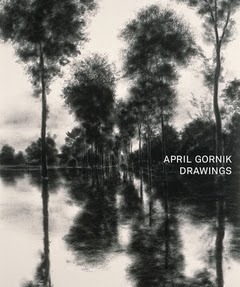 April Gornik from April Gornik Drawings. For a while, April Gornik painted her landscapes in secret. Thankfully, she is fully in the public eye today. She has had solo exhibitions in New York City and elsewhere since 1981 and is collected by muliple museums. Her book of charcoal drawings is a wonderful personal book, but I suggest, only an introduction or enhancement to actually seeing her works in person. To sit in front of an April Gornik drawing or painting and just gaze is the soul satisfying equivalent to listening to a favorite piece of music or reading a poem that strikes the heart. The work must be seen in person to be fully appreciated. The scale and evidence of the artist's hand make it so much more. Do see which of these museums are nearby and see for yourself. Oh, and do get this beautiful book before it is out of print. Thank you April! Many Thanks to the Parrish Art Museum for hosting this wonderful event. Curator and Director Terrie Sultan was in attendance with Curator of Special Projects Andrea Grover making sure all went well. I look forward to their next event. I'm so glad that I attended this one. 07.31.2014, Living in the Hamptons, by Gail Gallagher. 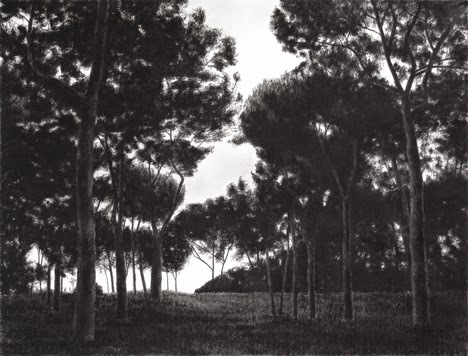 “Her paintings are the essentials of her artistic caraeer, but the charcoals, being dense and compact, balance the scale when weighed against the spacious and airier canvases, and make her artistic output whole. For a person so sunny and bright – both in personality and visual presence – to have created a dark counterweight that rivals her work as a painter, deepens and broadens the definition of herself as artist. In the drawings, she piles black on black, until it is as opaque and bottomless as Seurat’s Conté crayon. So, how far can an artist look into the woods? 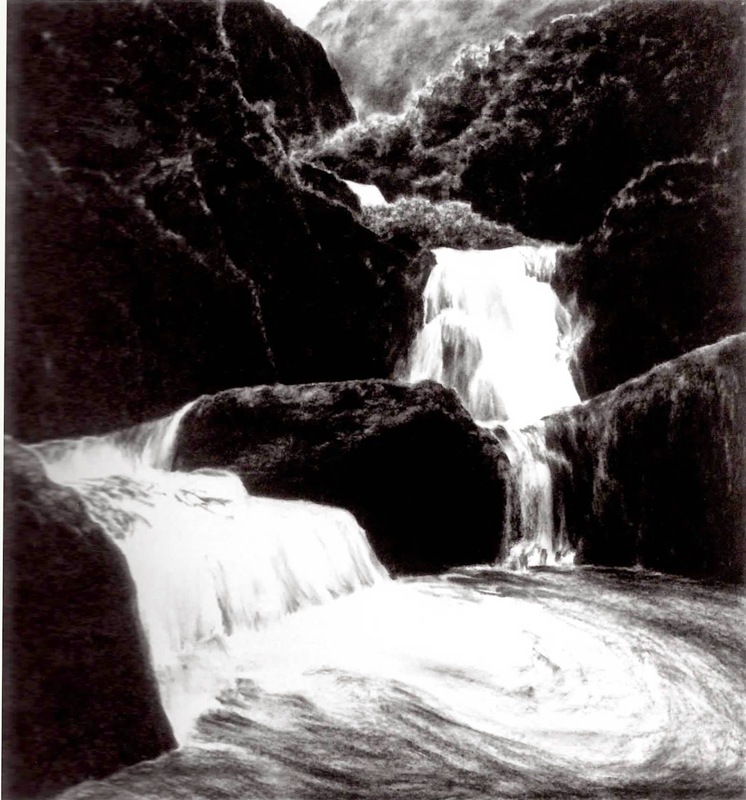 Until she reaches the white of the paper.” – Steve Martin from April Gornik Drawings. April Gornik’s work is both worldly and otherworldly, realistic and surrealistic, familiar yet unfamiliar. Each piece a meditation, visual poetry to be contemplated. The work inspires deep emotion. Composer and pianist Bruce Wolosoff was inspired to create a piece for cello and piano while gazing at April Gornik’s drawing The Woods, 2006 on his piano’s music stand. 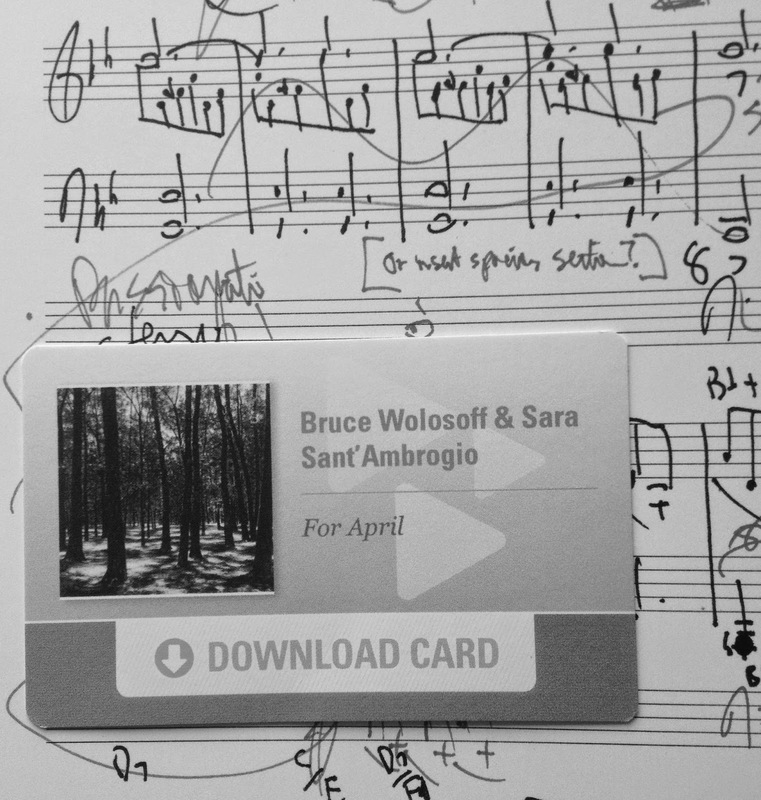 Wolosoff’s original manuscript of For April is printed in the book and a download card is included. In her conversation with Lawrence Weschler she describes how she began to create landscapes, “Well it was after college, and I was making sculpture-like objects. Like I would make a trellis and try to make it look as if light were falling on it, gluing tin to it, painting it a little. I was trying to do everything I could not to paint, since it was 1977, and you just weren’t supposed to do that anymore. I was trying to make what I was thinking of as primitive symbolic objects, something archetypal, I was really confused! And then one day I actually saw somthing in my head – three or four sticks backlit against the shore of some water – and don’t ask me where this came from, I have no idea, but immediately took to cobbling it together with the junk that was in my studio. I had some house paint and some regular paint, and I just made this thing, and stepped back.. and it was a landscape.” April Gornik from April Gornik Drawings. For a while, April Gornik painted her landscapes in secret. Thankfully, she is fully in the public eye today. She has had solo exhibitions in New York City and elsewhere since 1981 and is collected by muliple museums. Her book of charcoal drawings is a wonderful personal book, but I suggest, only an introduction or enhancement to actually seeing her works in person. To sit in front of an April Gornik drawing or painting and just gaze is the soul satisfying equivalent to listening to a favorite piece of music or reading a poem that strikes the heart. The work must be seen in person to be fully appreciated. The scale and evidence of the artist’s hand make it so much more. Do see which of these museums are nearby and see for yourself. Oh, and do get this beautiful book before it is out of print. Thank you April! Many Thanks to the Parrish Art Museum for hosting this wonderful event. Curator and Director Terrie Sultan was in attendance with Curator of Special Projects Andrea Grover making sure all went well. I look forward to their next event. I’m so glad that I attended this one.